Taiz – A high-level three-member UN delegation arrived for the first time in the temporary Yemeni capital Aden on Monday to discuss the humanitarian situation in the country and organize relief, humanitarian and health aids efforts. The visiting delegation was comprised of UN Children’s Fund (UNICEF) Executive Director Anthony Lake, World Health Organization (WHO) Director General Dr. Tedros Adhanom Ghebreyesus, World Food Program (WFP) Executive Director David Beasley and their accompanying delegations, and they were received by Yemen’s Prime Minister Ahmed Obeid bin-Daghr. Bin-Daghr renewed his demand from the international organizations to relocate their headquarters from the rebel-held Sana’a to Aden. The delegations’ visit is meant to organize the humanitarian and health relief supply to Yemen. Bin-Daghr said that once the organizations relocate, the government will offer support to enable them operate responsibly, transparently and neutrally. He expressed his hope that the visit will help in alleviating the Yemeni people’s suffering induced by the Saleh and Houthi militias coup, according to the Yemen news agency (Saba). The premier hailed the international organizations’ offering of relief aid and help to curb the epidemic of cholera. 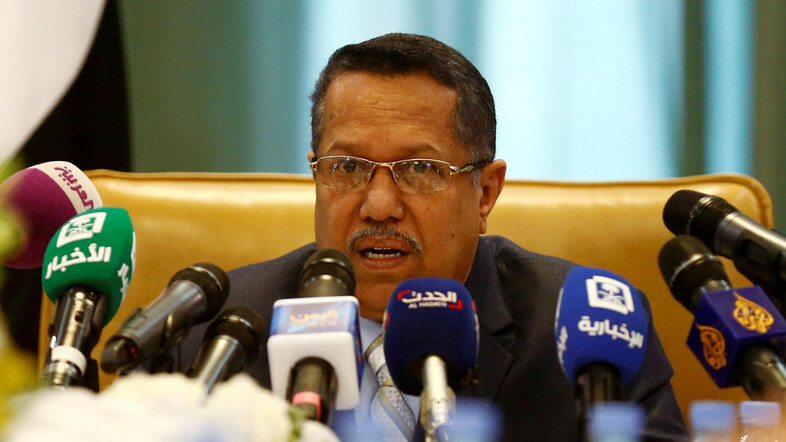 “The government is responsible for all the Yemeni people, from Mahrah in the south to Saadah in the north,” he said. “The government reaffirms its commitment to partnership with the UN to reduce the impact of the coup on the Yemeni people,” bin-Daghr added. He also said the militias are responsible for the prevalence of cholera and other epidemics in Yemen because of their irresponsible practices. The government has meanwhile contained the epidemic in its early stages of spread in Aden and neighboring provinces. In regards to peace in Yemen, the premier said the shortest way to reach it is through the implementation of the recognized references for peace, the Gulf Cooperation Council-brokered initiative, the National Dialogue outcomes and UN Security Council resolution 2216. Ghebreyesus stressed UN organizations’ commitment to the resolution, noting that all of the WHO’s activities are carried out in direct coordination with the legitimate Yemeni government, Saba said. “The visit aims at helping citizens in different provinces to raise awareness of the dangers of the cholera epidemic, which has spread in all governorates,” he added. For his part, Lake said that UNICEF provides humanitarian assistance to Yemen and aims to expand it through intensive programs. He added that the normal place for students is schools, and that they should protect themselves with knowledge rather than arms.